Tagged under Kousuke Fujishima, Sunrise (Studio), Tales Series, Games, Series. An awesome anime based on a game. So great. It's about Luke, a 17 years old prince (well, not really. His mother is the King's sister) who is so annoying at first, then because of someone he admired betrayed him... he changed n become more mature. 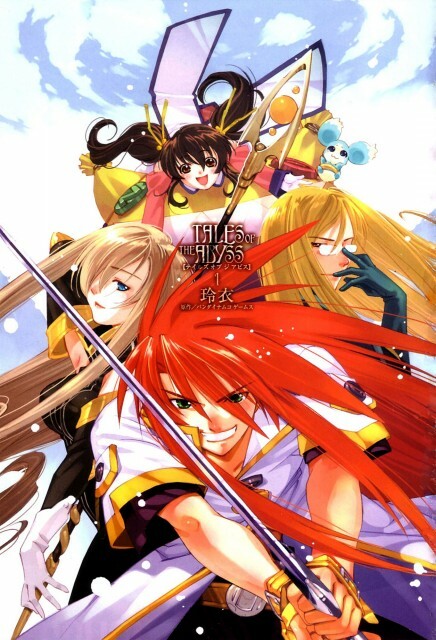 He went on advanture to save the world with Guy, his servant-more-like-a-best friend, Mystearica (or Tear) the magic user girl, Jade the genius Colonel, Ion the Fon Master (who looks like a little girl to me), Anise the little girl who is full of energy, and Natalia the Princess who is very good on her archery. The stories goes as Luke knows that he is not a real person. He is just a replica from the original prince who get kidnapped 10 years ago, Asch. Asch still alive, btw. He hated Luke because Luke stole his life, his name ('Luke' is Asch's real name), foolish, n so weak. But actually Luke didnt know about that. He got amnesia after that kidnapping event. But again, he actually didnt have any amnesia because he just being made/ alive at that time (so technically he actually 7 years old). Everybody call him Luke, even his parents, friends, servants, n his (Asch's) fiancee, Natalia. His face looks really similar to Asch. But, even he is just a replica, he have feelings too. He wants to exist just like the other human. He cut his long hair, wanted to be a new person, change his selfish-prince personality, give back 'his life' to Asch. But even after his parents knows, they still think him as their own son. Still, Luke feel bad n wanna give it back to Asch. Asch refused for his own reason. The characters development of this anime is really good. every main character have their own problem n it explained clearly on the episodes. Even the enemies. I laughed and sad at some scenes. Some of them are so touching. It's only 26 episodes. Try to watch it. The main characters and animation are awesome. The storyline is also very well done and impressive for an RPG adaptation. I recommend it! This anime has only 20+ episodes so it won't take much of your time watching this. No feedback on Tales of the Abyss.